Did you know that when you start a food blog, some scary foodies come and take you away at night and force you to sign a food blogging contract? Among other things, it specifies that the blogger must regularly exhort her readers on the simplicity and even superiority of making at home the kinds of foods that normal people buy in packages in the store. As you’ve probably guessed, the time has come for me to fulfill that obligation, but fortunately, I have found a recipe which actually is both simple to make at home and ridiculously tasty. Plus, if you are a righteous raisin-hater like me, you’ll never again have to pick raisins out of perfectly good granola. This recipe was given to me by a friend and is extremely flexible. 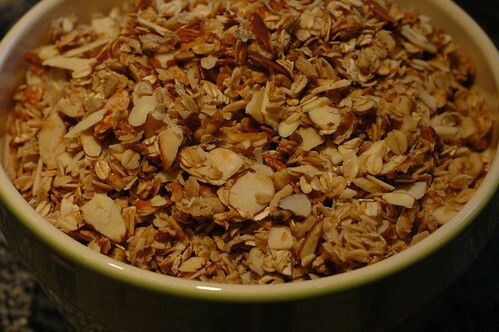 You want to aim for a 1:1 ratio of oats-to-other-stuff, and to avoid salted nuts or seeds in the add-ins. My version is based off of using half of a large container of oats because that makes about as much granola as my biggest bowl can manage, but you could easily adjust it if you have a really mighty bowl. Just don’t make more than you can eat; this tastes best in the first month or so after you cook it. I usually make this in 9×13-inch pans, where it turns out chewy because I pile it in an inch or two deep. If you prefer it crunchier, make sure to spread it into a single layer on baking sheets. One final note: if you’re the kind of person who is into dried fruit in your granola, you’ll want to add it after the granola is fully cooked. Put the water in a saucepan or kettle to boil. Preheat your oven to 250 F.
Mix the oats and other goodies with your hands. Add the boiling water, oil, and honey. I recommend that order, as the oil helps the honey slip out of the measuring cup. Clever, no? Stir to coat the ingredients. The mixture will just be damp, not actually very wet. Spread in pans or on rimmed baking sheets and bake for 50-60 minutes. Stir every 20 minutes or so to help it cook evenly. The edges should just be browning when you remove it from the oven. Be sure to take the granola off of the pans immediately, before the honey has a chance to turn into cement. (It’s also a good idea to wash the pans pretty soon.) I usually just turn it out into a bowl, but if you’re going for crunchy, you may want to turn it on to parchment paper or somewhere else you can spread it to cool. When cool, store in airtight containers (I use canning jars) for up to a month.